Very eagerly awaited since long, a divine day, the “Guruhari Suvarna Dixa Mahotsav” ultimately arrived and was celebrated in the actual/perceptible presence of Guruhari P.P. Swamishri Himself in the premises of Haridham, Sokhada, Vadodara on the greatly divine birthday of eternally original Aksharmurti Sadguruvarya Shri Gunatitanandswamiji on Sharadpoornima, the 26th October 2015 from 9.00 pm to 12.45 am in the night with hearts full of devotion and with discipline and which provided a life-long divine sweet memory! Around at least 30,000 devotees and the guests from entire Gujarat, Maharashtra, M.P., Punjab, Delhi, U.P., South India and very far off countries like America, Canada, London, Australia, New Zealand etc. took the benefit of darshans, divine speeches and the mahaprasad in this celebrations. All the devotees and the saints of entire Haridham family had devoted the best of all their efforts to celebrate the function with the real spirit atmiyata and cooperation and of their devotion towards their Guru/teacher/master and God in every field of services during this short time for preparations and celebrations. The Ambrish Hall, the Yogi Prayer Hall, Shri Gyanyagna Deri, before Shri Thakorji, the temple and the entire campus of the temple was so splendidly and gorgeously decorated with the ornamental arches depicting the slogans like “Tu Raji tha (May you be pleased)” and “Tare laine hoon (I/me, just because of you only)” and many posters/pictures showing/depicting the divine instance of rare and the invaluable/permanently unforgettable memories of the process of giving Dixa/initiation to P.P. Swamiji by P.P. Yogiji Maharaj and the incomparable blessing given by Him to Shri Swamiji then and even before the initiation and, because of all these, the entire premises looked golden but yet, full of devotion. To welcome the entry of P.P. Swamiji, a long carpet of flowers was made. The entire temple and its complete surrounding looked very beautiful with colourful lights during the night. In the excellently decorated arch at the top most portion of the vast 100 foot by 15 foot stage erected in the gigantic ground just opposite the temple, the lively statues of our prime God Shriji Maharaj and in His company, the similar statue of Sadguruvarya Gunatitanandswami were placed which attracted everybody’s attention instantaneously. 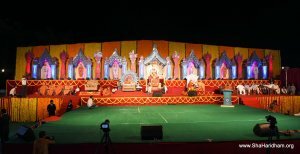 In the back, under the decorative arches on both the sides of the stage, the statues of Bhagatji Maharaj, Jagaswamiji, Shashtriji Maharaj, Yogiji Maharaj, Kakashri, Pappaji, and of Guruhari Swamishri sitting beside Shri Thakorji were giving the divine darshans to all. In front of this stage, another stage of 30 foot by 40 foot was also made for the presentation of cultural programs, the incidents and the raas. Every devotee coming from very far off distances finished his/her prasad so hurriedly and occupied his/her place in the celebration sabha sharp at 6.30 pm as he/she was extremely eager to take the darshans of P.P. Swamishri as it was being done after a long period of 5 and a ½ months and hence, the eye of everybody was full of tears of great divine pleasure. 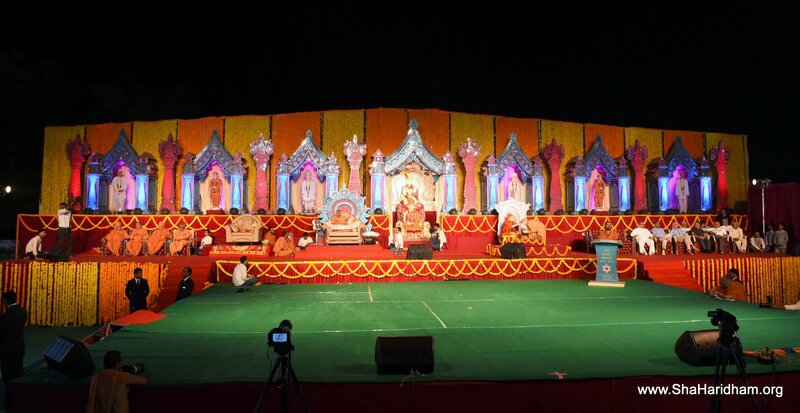 When the elderly saints and the young saints jointly presented on the stage and on LED screens put up at regularly small distances on the ground, the programs of process of historic initiation to P.P. Swamishri, the totally unmatched/never before blessing given by P.P. Yogiji Maharaj to P.P. Swamiji as Shri Prabhudashbhai before and as P.P. Hariprasadswamiji after his initiation, the pictures, the commentaries, the dialogues, the dances showing/presenting the unbelievable/unthinkable efforts made and the pain taken by P.P. Swamiji as a part of His devotion towards His Guru as per the hearty desire and the opinion of P.P. Yogiji Maharaj in creating a vast society of youths and the Ambrish made everybody feel as though they themselves were present there in the premises of Akshar Temple itself at that time, a 50 years ago, and it made them dance with an unbearable pleasure. Out of the invitee guests, the minister Shri Saurabhbhai Patel specially expressed his hearty feelings and respects for Guruhari P.P. Swamiji on behalf of entire satsang society and the entire Gujarat state. The elderly saint P. Nirmalswamiji, himself being a witness to this entire initiation process before 50 years, described it and talked of the glories of P.P. Swamishri. P. Bhaktipriyaswami described the historic incidents showing the eternal, divine and unified relation of the saint leader, the supreme saint P. Gunatitanandswami with Lord Swaminarayan and also described the historic incidents of Guruhari P.P. SwamiShri showing His eternal/divine Suhradbhav. P. Tyagvallabhswami and P. Sarvamangalswami, explaining the real way of repaying the debt of P.P. Swamiji for His having devoted 50 long and invaluable years of His life to us for our happiness, advised all to sacrifice everything in living our life exactly as per His wish, desire and directions. As per the custom of Sharad Poornima, 5 aartis were performed at regular intervals in between in which, the high dignitaries coming from Vadodara City, the foreign countries and the other devotees took part in doing so. Meanwhile, the small kids also presented a very interesting program of Dayaro in their innocent lovely/sweet language impressing all immensely. And, how can we forget the heart touching scene of the last aarti ? The eyes of everybody was overflowing with ecstasy looking at which, even the eyes of Guruhari P.P. Swamiji also got soaked and were overflowing with happiness. After the aarti and the Jayghosh, a magnificent fire cracking was done which woke up everybody from the divine abstract contemplation of akshardham and made them think that, at least now, we will have to go back and started toward their destinations. Even on the next day morning also, the eyes of Guruhari P.P. Swamishri, when He was sitting in Anirdesh, got tearful once again remembering the discipline, devotion and the spirit/zeal of all the thousands of devotees who came to participate in/enjoy the celebration. OZp kde’u S>¡“u âsunp lsu A¡hp¡ Nyfylrf kyhZ® rv$np dlp¡Ðkh, lrf^pd“p âp„NZdp„ Nyfylrf õhpduîu“p âÐen kp„r“Ýedp„ A“pqv$ d|m Anfd|rs® kv¹$Nyfyhe® NyZpsusp“„v$õhpdu“p dlpd„NgL$pfu âpNV$é‘h£ - ifv$‘|rZ®dp sp. 26 Ap¸¼V$p¡bf, 2015 “p iycfprÓA¡ 9 ’u 12.45 v$fçep“ c[¼skcf l¥e¡ cìesp’u “¡ riõsbÙ fus¡, rQf„Æh õd©rs âv$p“ L$fsp¡ ES>hpC Nep¡! kdN° NyS>fps, dlpfpô²$, dÝeâv$¡i, ‘„Åb, qv$ëlu ey.‘u., v$rnZ cpfs s’p Ad¡qfL$p, L¡$“¡X$p, g„X$“, Ap¸õV²¡$rgep, ÞeyTug¡ÞX$ A¡d v|$f v|$f’u ‘Z ‘^pf¡gp gNcN 30,000 dy¼sp¡A¡ v$i®“-‘fphpZu-dlpâkpv$“p¡ Agæe gpc gu^p¡. Nyfylrf õhpduîu“p A“yh©rÑ “¡ Arcâpe âdpZ¡ DÐkh ES>hpe s¡ dpV¡$ kdN° lrf^pd ‘qfhpf“p k„sp¡-dy¼sp¡A¡ ‘p¡s‘p¡sp“p k¡hpn¡Ódp„ M|b S> lmudmu“¡ ApÐduesp’u “¡ rhi¡j L$fu“¡ âcyc[¼s “¡ Nyfyc[¼s Av$p L$fhp“u cph“p’u Aë‘ kdedep®v$pdp„ DÐkh“u ES>hZu L$fu. îu op“eo v$¡fu s’p îuW$pL$p¡fÆ kdn s¡dS> ApMpe L¡$ç‘kdp„ rv$nprhr^“p rhrh^ âk„Np¡, õd©rsrQÓp¡, õhpduîu ep¡NuÆdlpfpS>¡ Nyfylrf õhpduîu“¡ R>¡L$ ‘|hp®îddp„ “¡ rv$np bpv$ Ap‘¡gp„ Adp¡O Aprih®Q“p¡, "sy„ fpÆ ’p', "spf¡ gC“¡ l„º' k|Óp¡hpmp sp¡fZp¡, v$unp dlp¡Ðkh“p„ sp¡fZp¡ Üpfp d„qv$f, A„bfuj lp¸g, kdN° k„Ly$g “¡ ep¡Nu âp’®“plp¸g“u ip¡cp A“¡fu v$u‘u EW$u lsu. k„‘|Z® k„Ly$g kyhZ®de gpN¡ R>sp„ c[¼scph’u ^bL$sy„ gpN¡ A¡ fus¡ ApQ}k (L$dp“p¡), sp¡fZp¡ hN¡f¡’u kyip¡rcs lsy„. õhpduîu“p ApNd““¡ h^phhp ky„v$f aŸgp¡“u L$pf‘¡V$ rbR>phhpdp„ Aphu lsu. fpÓ¡ sp¡ kdN° d„qv$f “¡ k„Ly$g“u ip¡cp rhrh^ f„Nb¡f„Nu gpCV¹$k’u M|b S> d“p¡lf gpNsu lsu. d„rv$f“u kpd¡“p rhipm âp„NZdp„ 100'x15'“p M|b S> rhipm “¡ cìe d„Q ‘f klº’u D‘fu õ’p“¡ Cô$v$¡h îuÆdlpfpS>“u r“îpdp„ L¡$ÞÖue kyip¡rcs L$dp“dp„ kv¹$Nyfyhe® NyZpsusp“„v$õhpdu“p„ lŸblŸ õhê$‘p¡ (d|rs®Ap¡) ip¡cu füp lsp. b„“¡ ‘pð®dp„ L$gpÐdL$ L$dp“-Np¡Mdp„ cNsÆdlpfpS>, ÅNpõhpduÆ, ip”uÆdlpfpS>, ep¡NuÆdlpfpS>, L$pL$pîu, ‘à‘pÆ s’p îuW$pL$p¡fÆ“u r“îpdp„ bufpS>¡gp Nyfylrf õhpduîu rv$ìev$i®“ âv$p“ L$fu füp lsp. ApNm L¡$ÞÖdp„ 30'x40'“y„ õV¡$S> kp„õL©$rsL$ L$pe®¾$d, âk„Np¡ “¡ fpk“u âõsyrs “¡ r“v$i®“ dpV¡$ s¥epf lsy„. v|$fv|$f’u ‘^pf¡gp c¼sp¡ A¡V$gp b^p DÐkyL$ lsp s¡ kp„S>¡ gNcN 6:30 hpÁep bpv$ âkpv$ gC klº TX$‘’u ‘p¡s‘p¡sp“y„ õ’p“ N°lZ L$fsp lsp. Nyfylrf õhpduîu“p„ Av¹$cys Agp¥qL$L$ v$i®“ kdN° dy¼skdpS>“¡ gNcN kpX$p ‘p„Q drl“p ‘R>u ’C füp„ lsp„ ! klº“ue Ap„Mdp„ lj®“p„ Aîy DdV$u füp„ lsp„. hX$ug k„sp¡ “¡ “p“p k„sp¡A¡ c¡Np dmu“¡ Apep¡rS>s L$pe®¾$d A“ykpf, Nyfylrf õhpduîu“u A¥rslprkL$ rv$nprhr^, õhpduîu ep¡NuÆdlpfpS>¡ âcyv$pkcpC s’p rv$rns lrfâkpv$õhpdu“¡ Ap‘¡gp A“y‘d Aprihp®v$p¡ s’p R>¡‰p ‘Qpk hj®dp„ ep¡Nubp‘p“p A“yh©rÑ “¡ Arcâpe âdpZ¡ Nyfylrf õhpduîuA¡ A‘pf ‘rfîd L$fu“¡ cìe eyhpkdpS> “¡ A„bfujkdpS>“p kS>®“dp„ ‘pepê$‘ “¡ L$pfZê$‘ A¡hu õhpduîu“u L$ë‘“psus cuX$pc[¼s “¡ Nyfyc[¼s“¡ sp×íe L$fsp k„hpv$ ×íep¡, âk„N-×íep¡, L$p¡d¡ÞV²$u, fpk hN¡f¡ rh^rh^ fus¡ d„Q ‘f “¡ A¡gCX$u õ¾$u“ ‘f Apb¡lŸb v$ip®hhpdp„ Apìep Ðepf¡ klº ÅZ¡ ‘Qpk hj® ‘|h£ Np¢X$g Anfd„rv$f“p„ âp„NZdp„ S> d|rs®dp“ ‘lp¢Qu Nep lp¡e A¡hu kpd|rlL$ rv$ìe A“ycrs klº“p l¥e¡ ’C “¡ D‘[õ’s klº L$p¡C A“¡fp Ar“h®Q“ue Ap“„v$’u T|du EW$ép! Apd„rÓs Arsr’dp„ Mpk sp¡ d„Óuîu kp¥fccpC ‘V¡$g¡ Nyfylrf õhpduîu“y„ kdN° kÐk„NkdpS> s’p NyS>fps fpÄehsu cphcu“y„ õhpNs L$fu, A¡d“p A„sf“p Alp¡cph“¡ hpQp Ap‘u ùv$e‘|h®L$ Arch„v$“p õhpduîu“¡ ‘pW$hu. hX$ug k„she® ‘|. r“d®mõhpduÆA¡ ‘Qpk hj® ‘|h®¡“u A¡ Av¹$cys rv$np-õd©rs“p kpnu lp¡hp“¡ gu^¡ A¡“¡ sp×íe L$fu õhpduîu“y„ drldpNp“ L$ey¯. ‘|. c[¼srâeõhpduA¡ NyfyZpd¹ Nyfy A¡hp Nyfyhe® NyZpsusp“„v$õhpdu“p dlpfpS> kp’¡“p rv$ìe, AÜ¥s k„b„^ “¡ A¡d“p Aâsud v$pkÐh s’p Nyfylrf õhpduîu“p rQv$pL$piu kyùv$cph“¡ Arcìe¼s L$fsp A¥rslprkL$ âk„Np¡“y„ Dv¹$bp¡^“ L$ey¯. ‘|. ÐepNh‰cõhpdu s’p ‘|. kh®d„NgõhpduA¡ õhpduîuA¡ Ap‘Z“¡ klº“¡ Ap‘¡gp ‘Qpk hjp£“p ârscphdp„ khp£‘fu Nyfyc[¼s Av$p L$fhp“u kpQu fus v$ip®hsp, õhpduîu“p Ndsp âdpZ¡ lp¡dpC S>hp“y„ Aplhp“ L$fu õhpduîu“u A„sf“u âkßsp âpá L$fhp A“yfp¡^ L$ep£. Nyfylrf õhpduîuA¡ lÅfp¡“u k„¿epdp„ D‘[õ’s c¼sp¡“p c[¼s, Dd„N, DÐkpl “¡ Nyfyc[¼s r“lpmu AÐe„s âkß l¥e¡ gNcN khp L$gpL$ ky^u kss ‘fphpZu“p¡ ^p¡^ hlphu; kpL$pfb°û“p b°ûkcf, b°ûcu“p Ad©sâhpldp„ ÅZ¡ klº“¡ sfbp¡m L$fu v$u^p “¡ Nyfy NyZpsus“p, õhpduîu ip”uÆdlpfpS> s’p Nyfyv$¡h ep¡Nubp‘p“p Apv$¡i A“¡ ùv$Ns Arcâpe âdpZ¡ klº“pe L¡$hm NyZ S> N°lZ L$fhp“p¡ MV$L$p¡ fpMhp dpV¡$ “¡ L$p¡C‘Z cp¡N¡ ‘p¡sp“p Æh“dp„, ‘rfhpfdp„, kdpS>dp„, d„X$mdp„ “¡ kÐk„Ndp„ "k„‘-kyùv$cph-A¡L$sp'’u Æhhp dpV¡$, r“›$p“u ×Y$sp dpV¡$ “¡ v$pkÐhc[¼s“u [õ’rs âpá L$fhp A¡“¡ ‘yô$ L$fsp A“¡L$ âk„Np¡ Üpfp õ‘ô$ Apv$¡i Ap‘u klº“¡e M|b ^Þe L$ep®. A„s¡ eyhp“p¡A¡ "Aphp¡ Ahkf “l] dm“pf....' A¡ L$us®“ ‘f k„yv$f fpk ‘Z âõsys L$ep£. Ap ifv$-DÐkh“u rhriô$ âZprgL$p A“ykpf kde¡ kde¡ ‘p„Q Apfsu Dspfhpdp„ Aphu, S>¡dp„ hpfpafsu hX$p¡v$fp “Nfdp„’u s’p v$¡i-rhv$¡i’u ‘^pf¡gp dlp“ycphp¡ “¡ c¼sp¡A¡ r“fpS>““p¡ gpc gu^p¡. hÃQ¡ fpS>L$p¡V$’u ‘^pf¡gp “p“p qL$ip¡fp¡A¡ A¡d“u L$pguO¡gu cpjpdp„ âk„N“¡ A“yê$‘ X$pefp¡ ‘Z fS|> L$ep£. R>¡‰u kd|l Apfsu-dlpApfsu“y„ Av¹$cys ×íe sp¡ L¡$d c|gpe?! klº“u Ap„Mp¡ Ap ^Þe-rv$ìe õd©rs“p k„cpfZp„’u lj®’u R>gL$psu lsu “¡ s¡ r“lpmu Nyfylrf õhpduîu“p„ “¡Óp¡ ‘Z ÅZ¡ L$fyZpcu“p„ ’C âkßsp’u R>gL$pC füp„ lsp„ ! Apfsu “¡ S>eOp¡j bpv$ cìe ApsibpÆ k„‘ß ’ep ‘R>u ÅZ¡ lÅfp¡ dy¼s Anf^pd“u rv$ìe kdpr^dp„’u ÅN©s ’C, "lh¡ sp¡ S>hy„ S> ‘X$i¡' A¡hp ¿epg kp’¡ N„sìeõ’p“¡ S>hp dpV¡$ rhv$pe ’ep ! buÅ rv$hk¡ khpf¡ Aphp A¥rslprkL$ dlp¡Ðkh“u ES>hZu bpv$ Ar“v$£idp„ bufpS>¡gp Nyfylrf õhpduîu“p„ “¡Óp¡ ‘Z dlp¡Ðkh dpZhp Aph¡gp lÅfp¡ c¼sp¡“p„ riõs, c[¼s “¡ Dd„N“¡ k„cpfsp„ k„cpfsp„ afu kS>m ’ep !